Native American inspired, crystal staffs & wands. and a single feather attached by a leather cord. 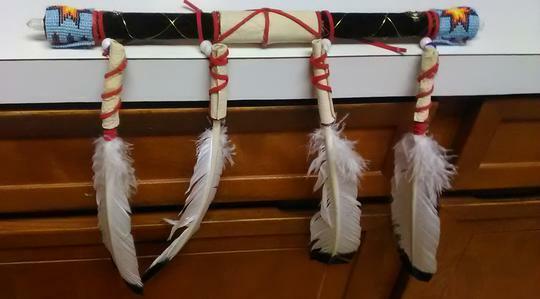 This first staff to the right, Thunder Hawk, which has additional items, is a very special custom order. Sorry, it has been gifted and is committed to a very special friend. Each standard 5' (60") staff typically sells for: $365.00 (USD) - plus the cost of shipping. Various colors of natural leather to wrap each wand, other than tan & brown which are standard, are available at an added cost of $10. each wand. For this specific option, please see the color swatches on the LEATHER COLORS web page. You can add colorful Native American bead work for $10. for each wand. You can also add an animal totem to each wand. The cost of these totems will vary based on the material or stone mineral used for each totem. Each custom designed, hand made wand is comprised of a 1/2"
wire and contrasting, different color leather in the handle area. ​The approximate size of each wand is: 1 foot (12") long by 1/2"
Each wand sells for: $124.00 (USD) - plus shipping. These four current wands that you see have all been sold. As shown in the below two photographs, you can add clusters of small feathers to your wand for an additional $5. each wand.